How do I decorate a single element or connection? Usually, it&apos;s faster and easier to decorate elements and connections according to the data in their fields—for example, creating a decoration rule that selects all elements with the element type "Organization", and color-codes them by their sector. But, if you haven&apos;t added field data, or you just want to tweak the style of one single item on the map, it&apos;s good to know how to decorate a single element or connection. First, go to your map and click on the element or connection you want to decorate. A thin outline will appear around an element to let you know that it&apos;s selected, and when a connection is selected, it will turn opaque. Click MORE OPTIONS, and select Decorate elements to bring up the decoration builder. 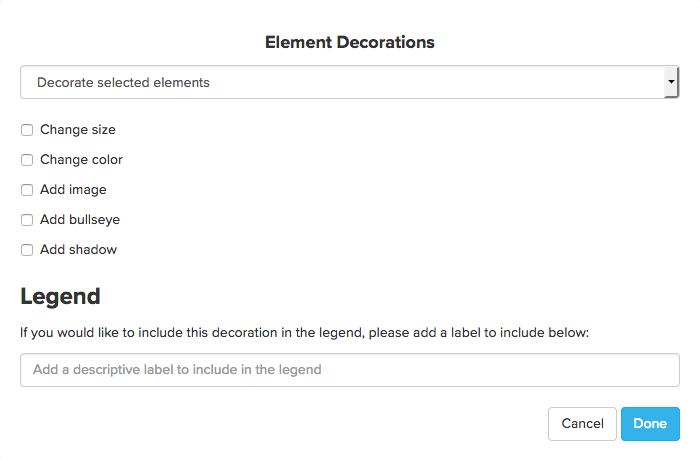 At the top of the decoration builder, make sure the dropdown menu is set to Decorate selected elements. Use the Builder to build your desired decoration, optionally add a label for the Legend, and click Done. Kumu will return you to the map to preview your changes. If you like what you see, don&apos;t forget to click SAVE at the bottom of the Basic Editor to save your new decoration. If you need to make a few changes, just open the Basic Editor, scroll down to find your decoration at the bottom of the list, and click the pencil icon to edit the decoration. To decorate a single connection, the process is nearly identical. You start by selecting the connection, opening the Basic Editor, and clicking MORE OPTIONS. Then, instead of selecting Decorate elements, select Decorate connections. In the decoration builder, set the dropdown at the top to Decorate selected connections, and the rest of the process is the same. You can use a label or ID selector to target and decorate an individual element or connection in the Advanced Editor. To open the Advanced Editor, click the Settings icon on the right and click SWITCH TO ADVANCED EDITOR at the bottom. Then, use our property reference to explore all the options for decorations in the Advanced Editor. Keep an eye on your map while you code in the Advanced Editor—Kumu will parse your code and preview your changes while you work. If you like what you see, click SAVE at the bottom of the Advanced Editor. Shortcut: Press . on your keyboard to quickly open the Advanced Editor.